Can Germans Be Credited for Some Mexican Music Styles? Could an instrumental German polka band piece, or what seems to be one, may in fact not be a German song at all but a Mexican one? Wait for the words...Yes it could! The music you hear is a Mexican polka style of music known as norteño. Music from the northern part of Mexico, norteño, meaning "northern," or música norteña, "northern music," was influenced by German settlers in Texas around 1830. It is no coincidence that some types of Mexican music have the German polka "oom-pah-pah" influence. There was a large migration of Germans to southern Texas from the 1830s to the 1840s. According to the Texas State Historical Association, the largest ethnic group in Texas born in Europe or whose parents came from Europe hailed from Germany. By 1850, Germans made up more than 5 percent of the entire population of Texas. This part of Texas became known as the German Belt. At that time, as it is now, the Río Grande marked a political and geographical divide more than a cultural one. The musical style and even the instruments of the German immigrants were adopted and became popular among those of Mexican heritage. One of the most influential musical instruments of the Germans' musical style, the accordion, became especially popular and was frequently used in dance music such as waltzes and polkas. The popularity of norteño among Mexican-Americans spread in the 1950s and overlapped with popular American styles of rock and roll and swing. This overlapping of musical styles became known as tejano, literally the Spanish word for "Texan," or more appropriately, "Tex-Mex," a blending of the two cultures. 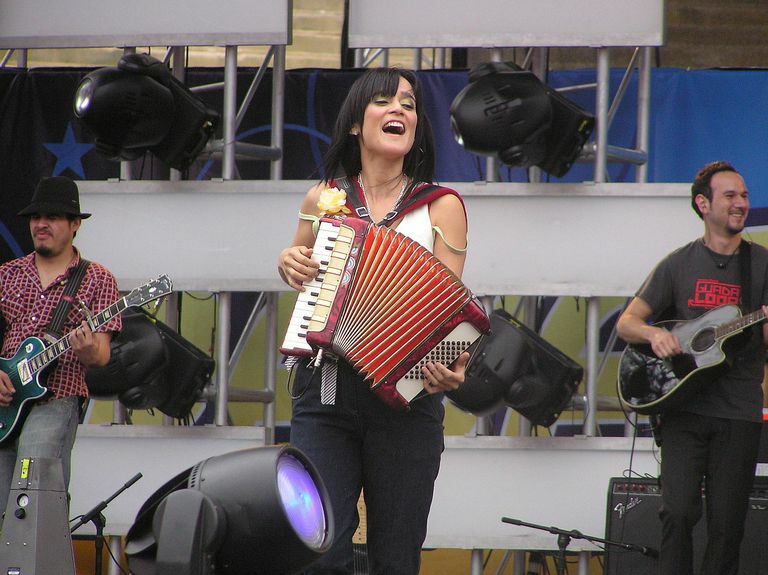 A conjunto norteño, or norteño "ensemble," features the accordion along with the bajo sexto, which is a Mexican instrument similar to a 12-string guitar. Over time, norteño mixed with other music styles to form unique Mexican music styles, including quebradita, which is a style that is heavy on the horns, banda, a style similar to the polka, and ranchera, a traditional Mexican music genre. The norteño musical style influenced music from other regions of Mexico, such as what is probably the most widely-recognizable form of Mexican music, the mariachi music from the Guadalajara region. Norteño or tejano-style music is nearly always performed in Spanish, even by Mexican-Americans who speak primarily English. For example, native Texan and Spanish-English crossover artist Selena sang in Spanish before she could properly speak Spanish. For Selena, later known as the Queen of Tejano Music, the competition was less fierce in the Mexican music market compared to the American music market. She rode the Mexican music market to fame and ranks as one of the most influential Latin musicians of all time. The norteño or tejano-style genre in the United States is often erroneously viewed as synonymous with Hispanic music, but it is just a type of Spanish-language music and represents only one genre of Mexican music. Mexican music is incredibly diverse and Spanish-language music is even more diverse, spanning many continents and representing different nationalities around the world.